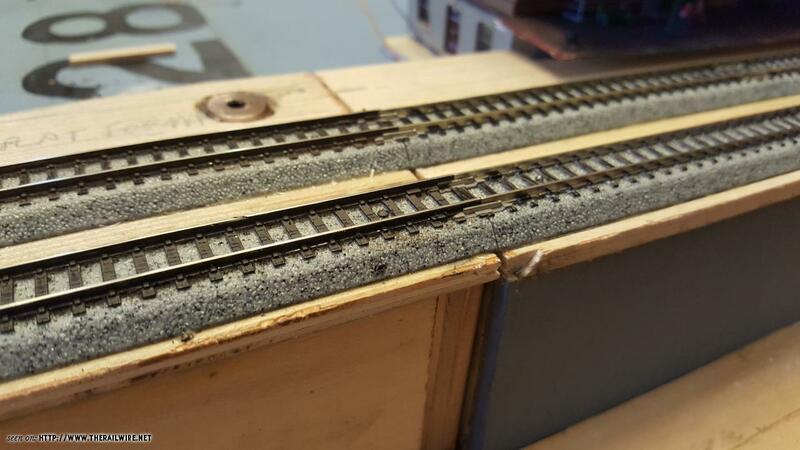 I ended up using the track nails with yellow glue along the full length of the roadbed. I will be studying the @atsf_arizona playbook to make sure you have to really look for the nails. Cumberland module update: rails painted on the bridge modue. 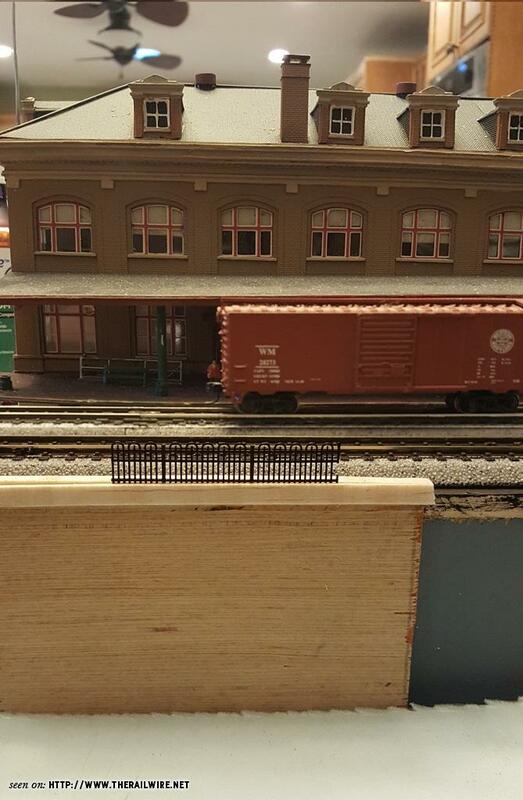 And another TTrak tech question. Y'all know how I feel about structure lights... is there a standard connection for an A.C. bus line? I should be aware of, or am I on my own with that? Well, dang... what an obvious solution! I'm sure I have an old smoke detector or something around here I can steal a fitting from... Then I just have to build a switch and buy some batteries! Thank you Hive Mind! Thank you for the updates. Since I'm not involved with a singular Ttrak group at the moment, I don't want to run afoul of any accessory standards, so I'll just go ahead and wire in a battery port to take care of local needs. A little proof of concept as we inch our way forward on this, sampling how the flood wall will come together. I love the look of the Atlas hairpin fencing, but it's made from the slipperyest plastic known to man, so it's hard to install and keep it aligned. Especially on a portable module, I'm concerned about it's durability. I'm using 1/4" plywood for the wall, and mounting two strips of wood at the top, leaving a slot to wedge the fence into. Once everything is placed and I'm happy with the alignment of the whole 2 feet, I'll flood the gap with .CA. .... and buy some batteries! 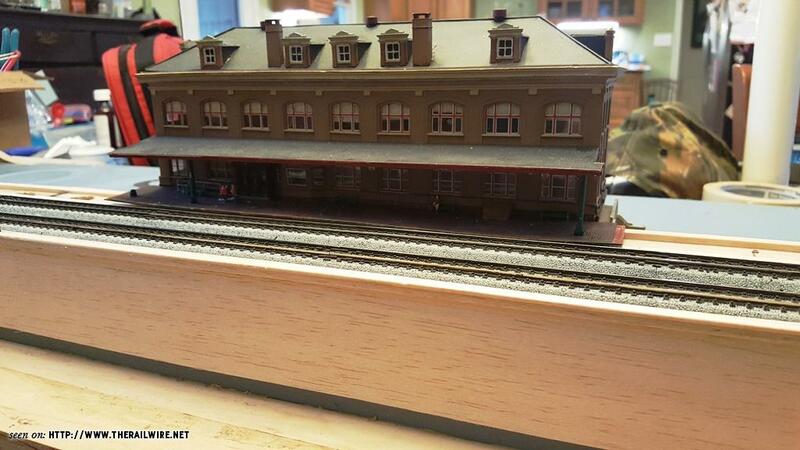 I better focus on rehabbing that station platform... she's gotten a little rough. It was a good day in Module Land today. Started the day with a little rain this morning, which cancelled all the plans for yard work. 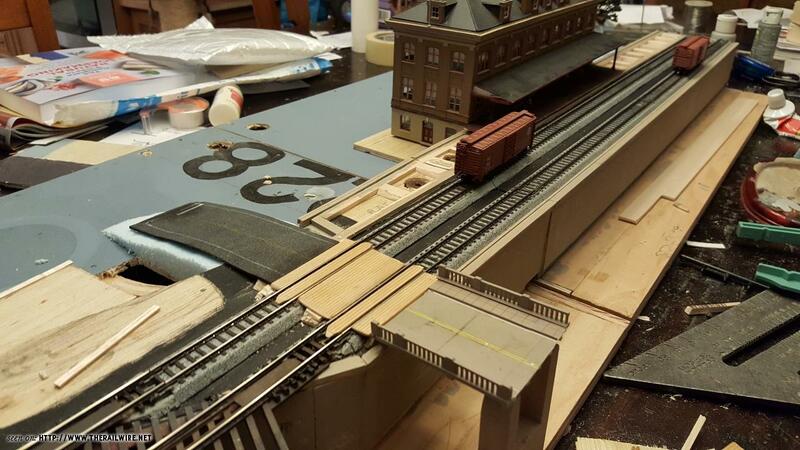 So I set about wrapping up all the bits of the project that would involve power tools, noise and sawdust, freeing up my evenings this week for repairing structures, laying out the rest of the scene, and adding the details that will bring the scene to life. I started with the bridge piers for the highway. 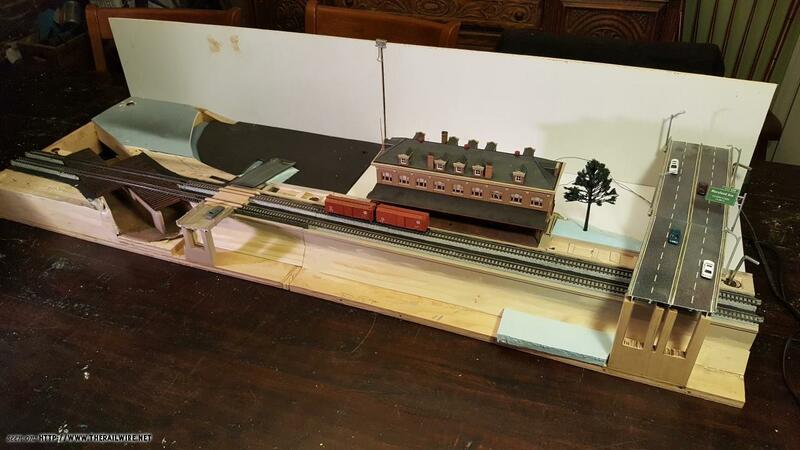 On the original layout, I had cobbled together piers that were functional, but not in keeping with the prototype, and since they were on a "permanent" layout, they weren't terribly robust. I wanted to make these sturdier, since they would be on a portable module, as well as project a good 2 to 3 inches beyond where the next module would be, so it's pretty exposed. To that end, I took a piece of poplar 1x that I had liberated from the scrap bin at the high school wood shop back when we were building the sets, and planed it down to 1/2" thick, and set about to cut pilings out of it to resemble the prototype. This is glued and screwed to the plywood base, so any kid that bumps it is going to get a bruise before the bridge gets jostled. I also worked on adding a flare to the bottom of the flood wall. I found some prototype images, and this wall looks like it was rather hastily built. The flare is uneven, and a bit chunky in places, more like some modern sculpture than functional architecture, and I decided that I couldn't compete with the original artist... Instead, I built a nice, geometrically even flare that runs the length of my channel that pleases my Teutonic nature. The piece of blue foam in the pictures represents where the water level will be. I also added 1/4" foam core as a base for the structures. 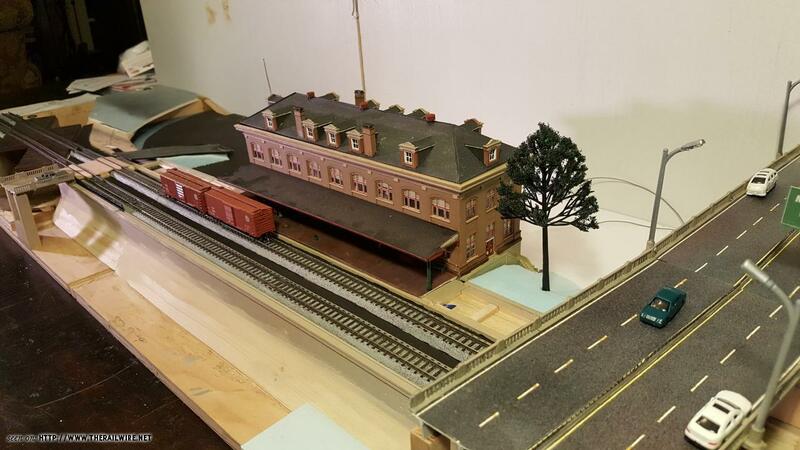 This gave me the elevation I needed to put the station platform right where I want it, and will give me a nice paper surface to adhere various scenery bits to. It also gave me a nice smooth surface over the leveling bolts, which are accessed now by 1/4" square holes in the foam core. And finally, I cut and attached my skyboards, which are 10" high, the ruling dimension of the shelf over my desk where I will display the station module on when it's not deployed. Anyhoo, that's tonight's progress report. Looking good, Lee! So what’s the deal on sky boards with T-trak? Yes or no? 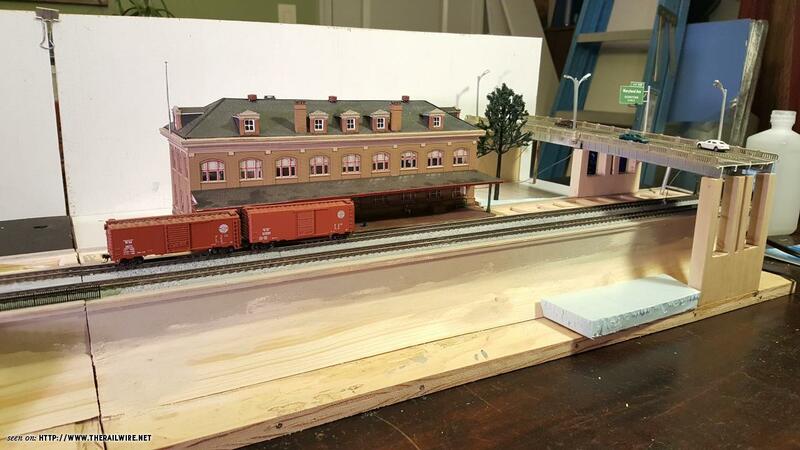 Modeling the C&O in Eastern Kentucky. I'm putting them on mine because I want the photos I take to show the work, not the messy kitchen in the background! I'm also working out making them part of the "shipping crate" for moving the units around with minimal exposure to the elements. I'm pretty sure I've seen skyboards on TTrak set ups, but being a noob, I could be running afoul of the law. I'm sure there's something in the online specs. One thing I may have to deal with is module depth... I've added the 1/4" skyboard behind the base of 14", making the total depth 14.25". The diagrams I've seen of layouts show the "trough" between modules as being 20mm, so I think I'm okay, as long as I can tuck my wiring under the module. Worst case, I'll run the back of the module across the table saw and nick 1/4" off of the box, and keep that in mind for the next time I build a set. I don't have them, but wish I did.